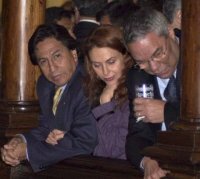 Alejandro Toledo of Peru Posible has managed to carve a place for himself in Peruvian politics despite not having a real political organization behind him. In the tainted 2000 campaign in which Alberto Fujimori won a third presidential term, Toledo, now 55, became the de facto leader of the opposition. Now he can lay claim to the presidency after an ugly, conflict-filled campaign. On June 8,he beat Alan Garcia in a runoff with 52% of the vote. Despite the precedence of a Toledo presidency, the man himself has performed poorly in his first two years in power, squandering any political good will and capital he might have had. Now in his third year in power, he is just hanging on by the skin of his teeth to squeak through to the end of his term. Although the economy is coming out of a prolonged downturn and growing at the fastest pace in Latin America, Toledo's campaign promises and ham-fisted management skills have driven his government into a quagmire of unsatisfied social demands and political upheaval. Toledo has been on the Peruvian political scene since 1981 when he returned to Peru from his studies abroad. He joined the staff of Labor Minister Alfonso Grados in the second Fernando Belúnde government. He was Grados's social policy advisor in an attempt to temper the neo-liberal line coming from Manuel Ulloa's cabinet. At the time, I was The Andean Report's politics and labor affairs writer and Grados frequently handed me over to Toledo for background briefings. It was really tough to pin down Toledo on specifics. I thought it was because he was hesitant to get burned politically in an untested arena. Now I realize he was winging it as a policy maker. His studied baritone voice, tailored, stylish suits and carefully coiffed black hair gave the impression of being assembled to counter his facial characteristics of an Andean Indian -- dark skin, large angular nose, short stature. At the time, I did not know that he had been a shoe-shine boy in Chimbote or his large family of 16 brothers and sisters, of whom six had died while he was still a child. Credentials as an economist: He has two masters degrees and a Ph.D. in human resource economics from Stanford. Toledo was frequently cited as a possible candidate for finance minister in both the Belaunde and Garcia governments, and Toledo played the media well to magnify his standing. He has worked for the World Bank, the International Labor Organization, the Inter-American Development Bank and the US International Agency for Development, among others. He was a Visiting Scholar with Harvard University's Institute of International Development from 1991 to 1994. In Peru, he has worked with ESAN (Escuela de Administración de Empresas para Graduados), the leading business school in the country. However, he has no real administrative experience. He ran for the presidency in 1995 but barely appeared on the radar screen. Because he was not able to get the required 100,000 signatures to register his party, he had to form an alliance with another group, Coordinadora Democrática. He won 3% of the valid votes, compared to Fujimori's 64%. His coalition got 4% of the congressional vote and five seats. Shortly after the elections, he broke with CODE's José Barba Caballero. Of course, no presidential candidate was able to compete with Fujimori because he was riding high from defeating subversives, reducing inflation and rekindling the economy. See the Fujimori section. 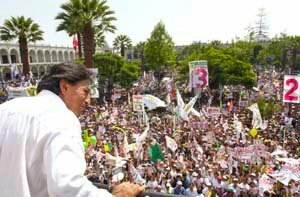 In the 2000 campaign, Toledo surged to the front as the main opposition vote getter against Fujimori. It caught most political insiders by surprise. He had strong support from the U.S. Embassy as the annointed messiah of democracy, especially in the 2000 campaign and aftermath. He tapped into the same underdog current that brought Fujimori to the presidency in 1990. His Indian features differentiated him from the white, creole candidates that political parties put up for elected office. He was the least objectionable -- low negatives in politico speak -- of the opposition candidates. Since most frontrunners had danced with and without Fujimori for 10 years, most voters could not stir up any enthusiasm for them. As the first viable presidential candidate from an Andean Indiana background, he stirred up a lot of support from among the cholo voters. He also allowed anti-Fujimori blocks, especially Lima's old elites, to side with the opposition without seeming to be against cholos, negros, chinos and provincial caciques, Fujimori's traditional supporters. In other words, no racial slur tainted Toledo's support, something that hamper previous candidacies (Vargas Llosa, Perez de Cuellar). Toledo was separated from his wife, Elaine Karp, a Belgian-born Jewish American anthropologist, but the relationship was revived prior to the 2000 campaign. A gringa trophy wife was expected to score points in the working class from which Toledo has emerged. But during the 2001 campaign, Karp has proven a sharp-tongued speaker who has been a liability for the candidate, but any comparisons with Hillary Clinton are off the mark. Toledo's private life has come under examination, including a 13-year-old illegitimate daughter whose cause became a major issue once Toledo took the presidency. Toledo and Karp have one daughter. Toledo has also admitted that he tested positive for cocaine usage in 1998, saying that he had been abducted by Vladimiro Montesinos's goons and videotaped with prostitutes to blackmail him. He was born in Cabana, Ancash in 1946. He studied at the (Jesuit) University of San Francisco on a soccer scholarship. He then went on to Stanford University for graduate degrees. Centre for the Study of Democracy at Queen's University and by the Canadian Foundation for the Americas (FOCAL) provide Peru Elections 2000 and Peru Post Elections for extensive coverage of the 2000 campaign. It is not being updated now. Peace Corps - collection of Toledo news articles and profiles.